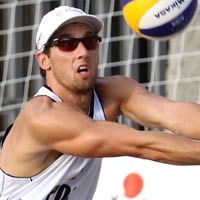 � In Fijalek's first ever tournament on the FIVB Tour, he and Mariusz Prudel advanced to the main draw after being seeded 43rd in the qualifier, then in his first main draw match the duo defeated top-seeded Harley Marques and Pedro Salgado. � Fijalek won his first FIVB medal in the 2010 Marseille event, where he and Prudel overcame a first-round defeat to win six straight elimination matches en route to a bronze medal, the first ever medal for Poland. 2011: Fijalek and Prudel won a pair of silver medals in their five semifinal appearances, including a Grand Slam in their home country in which they went undefeated all they way to the Gold Medal match. In Fijalek's first World Championships, in Rome, the duo placed fifth. The pair ended the season as the fourth-ranked team on the FIVB Tour. They placed ninth in the CEV European Championship. 2010: Fijalek and Prudel played in 11 FIVB events, finishing fifth or better six times. The duo advanced to two semifinals, earning their first medal in Marseille, a bronze. They finished ninth in the CEV European Championship, their only event on that tour. 2009: Fijalek continued his partnership with Prudel, playing in eight FIVB events, getting their best of seventh place in their home country. They played in five tournaments on the CEV Tour, with a best of fifth in the European Championship. 2008: Fijalek reunited with Prudel and competed on the FIVB Tour for the first time. In their first event, they qualified for the main draw as the 43rd-seeded team, then knocked off the top-seeded team. The duo played in six FIVB events, including a fourth in Bahrain. Fijalek and Prudel placed 17th in an FIVB Challenger event. The duo won the CEV U-23 European Championships, and played in seven CEV events with a best of third, and placed fifth in the European Championship. 2007: Fijalek partnered with Orman the entire season, competing in six CEV events with a best of 13th. The pair ended the year by finishing ninth in the FIVB U-21 World Championships. 2006: Fijalek and Krzysztof Orman placed second in the CEV U-20 European Championships and then he partnered with Prudel in the FIVB U-21 World Championships, placing fifth after losing to the eventual gold medal winners. 2005: Fijalek played two tournaments with Mariusz Prudel, finishing second in the CEV U-20 European Championships and then third in the FIVB U-19 World Championships. 2004: Fijalek began his beach career with a pair of events with Grzegorz Pajak, finishing third in the CEV U-18 European Championships and then placing ninth in the FIVB U-18 World Championships.